Find the right tour for you through Anzac Cove. We've got 61 tours going to Anzac Cove, starting from just 3 days in length, and the longest tour is 45 days. The most popular month to go is September, which has the most number of tour departures. "Amazing! The dawn service was unforgettable, and the guide was incredibly knowledgeable"
"Excellent itinerary, guides and group. Definitely, I will repeat the experience." "Tour was great. Buffet brekki n dinner excellent. Accommodation v good. Only prob..."
"Excellent arrangements by Neon Tours. The tour director was extremely knowledgeable..."
"The guide and driver we pleasant and helpful. 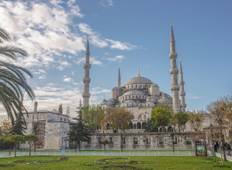 The sights we amazing and far exceeded..."
"Turkey is truly and amazing country and has it all. From the significance of ANZAC,..."
"Fantastic! Well organised and informative. Loved it from the first moment." "One of the best trips I have done everything was perfect"
"Excellent service. Everything was seamless. Great itinerary."